I wasn’t always a Future Islands fan and it wasn’t their music that won me over when I started to consider myself a fan. It was Hopscotch 2013 and Future Islands breakout album Singles was still in the works, but it was a combination performance of many of those new songs that would make up that album and a panel talk featuring Sam Herring among others that really converted me. When I saw them at New Brookland Tavern in 2010 I don’t think I really “got it” so to say. The guttural growls and theatrical antics of frontman Herring caught me off guard I guess, and it took me hearing the background of the band and why he does what he does from Herring himself to finally understand. He spoke unabashedly about stealing other bands fans. He said they’d open for any band out there if it meant the chance to steal their fans. The band that brought up the conversation was actually Passion Pit. While the Hopscotch panel on touring and life on the road featured five guest speakers, Herring stole the show telling stories and explaining how Future Islands came to be the band they are today. At the time he spoke of the struggle of existing as a band in this era with the cult type following they had at the time. Little did he know then that a break out late night performance and high-profile shows at SXSW the following month would blast them to another level of they’d always struggled to reach. 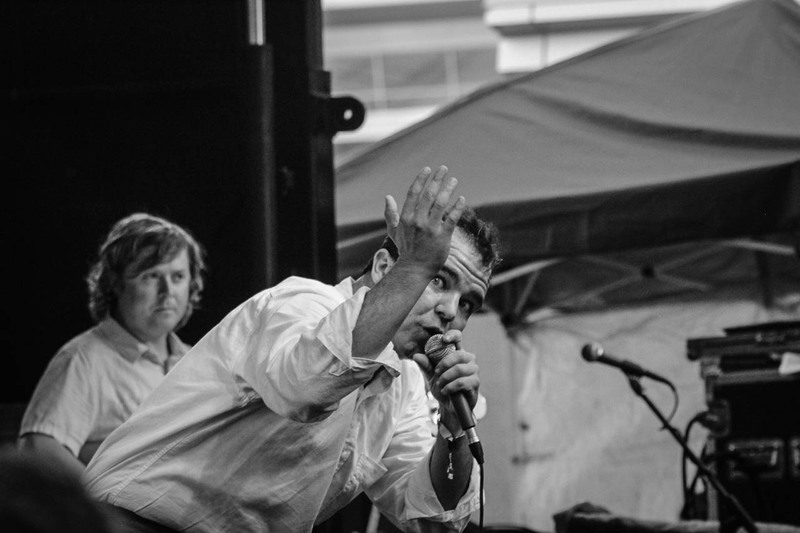 Since then Future Islands has taken advantage of their new-found level of fame, spending months on months on the road touring on Singles with dates still lined up through fall of 2015. It hasn’t been until recently that new songs have started to pop-up in live performances, giving us a glimpse of what’s to come. Last time Future Islands visited Columbia and Charleston it was 2010 and they played New Brookland Tavern and Tin Roof. Now the stages will be bigger as Herring beats his chest and bellows to both new fans and ones who have been there for the journey.